There are so many things to do in Cancun that is it quite difficult for you to make a complete list, but for informational purposes and beyond the city, we suggest you: Isla Mujeres and beautiful beaches of fine sand. Punta Isla Blanca, or Isla Holboch which is a small island somewhat touristy and very quiet, or the cenote near Cancun and villages of the Yucatan. The organization of the Marathon has a few hotels that offer us preferential prices and from which it is easier for us to get the participants to the start area. However, you are free to reside in an hotel of your choice. Mexican cuisine is very diverse because of its pre-Hispanic and European heritage with influences of the African cuisines, Caribbean, Asian and Middle Eastern. In general it is an excellent cuisine. Of course, a good dish of red beans should be avoided before the Marathon. We will soon prepare a list of restaurants for you. The Cancun International Airport is the most important in Mexico, after the one of Mexico City. You will not have difficulty finding the flight that suits you best, check with your travel agency or simply online. Shuttle buses depart regularly from the airport to the hotel zone. 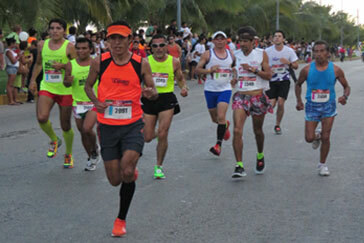 Numerous musical bands playing all along the course and at the finish, composed predominantly by traditional Mexican music. With a perfect flat race course, the confirmed athletes can improve their performances and the novices to finish without too much difficulty. 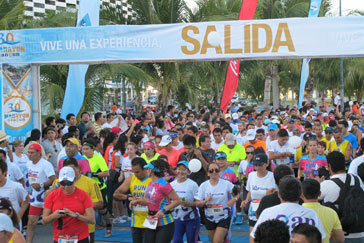 Organized by Fundación Ku, with the close collaboration of Instituto Municipal de Deporte de Cancún. Bienvenidos ! The city of Cancun is located on the northeast coast of the Yucatan Peninsula in the state of Quintana Roo, bordered by the Caribbean Sea and Nichupte Lagoon, Cancun is one of the most famous tourist resorts of the world. 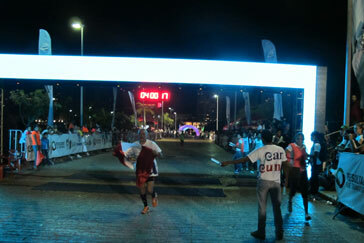 Cancun Marathon just run it ! Mexico offers one of the most exhilarating experiences available. Royal Swimming with dolphins is the ideal way to discover this sweet mammal, friendly and smart! Cancún is a city located southeast of Mexico, on the Yucatan Peninsula. The city has 526,700 inhabitants. 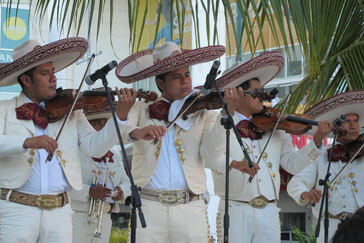 Cancun has become famous thanks to tourism which represents over 50% of the economy of the city. Many resorts offer a wide range of offers that delight travelers. Cancun has a subtropical climate with low rainfall, it is the ideal place to spend a relaxing holiday on white sand beaches, dressed with palm trees and a turquoise blue sea.